It has been a long time since I have blogged. We have been in a “season” here. A time of reflection, learning, crying and laughing. We have lived in New Mexico for 3 months on November 4. We (3 adults) have lived in our RV for almost 3 months. I have worked 12 hour days and some weekends for 3 months. Derek has emptied black tanks, fixed leaks, switched our life over to NM for 3 months and worked on top of it all. We have lived a very different life for 3 months. One of smallness…not just in living space but in everything we do. Before this journey as we packed up our life in Illinois, I would find a penny here and a penny there. Dimes are our signs from God. Double portion of blessings found in silver in the craziest places. Some of our readers may have heard Derek’s testimonies on this. But I was finding pennies. One at a time. At first I sneered at God and said, “Sure. Derek gets dimes and I get pennies.” But in my devotional time I felt God was saying, “It is in the small things. Every little thing counts. Every small blessing is me just as large blessings are.” I began to rejoice in a penny just for the sake of remembering all the small things add up. On November 1st we were in Albuquerque, NM. We received the news that our home in Huntley had been rented finally. What a load off our minds financially. What a long-awaited blessing for us. I walked out to our truck from our hotel room. Our truck was backed into a place far away from others. As I walked to my side of the truck, the ground caught my eye. 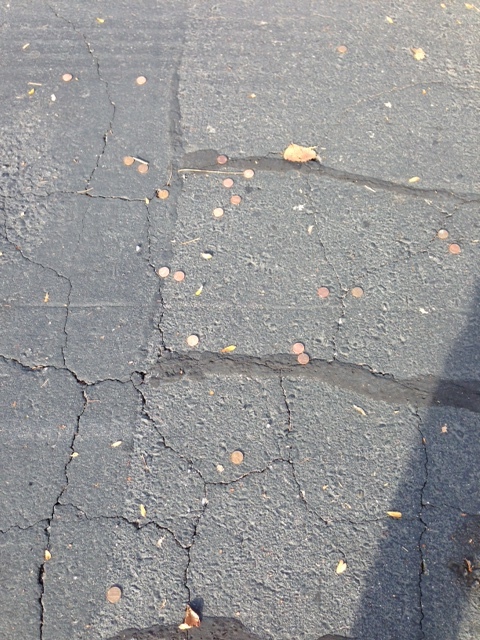 There on the pavement with no other vehicles around were many pennies. 41 to be exact. There are many references in the Bible about 40. Years in the desert. Days in temptation. The trials of life. I am weak. The last 3 months have been a trial for me. It was a temptation to just move the life we had in Illinois to New Mexico. That wasn’t why we were called here. A refining is happening to our family. A change needs to happen. One little thing at a time. I must hear the cry of His people. I must recognize the cry. I wasn’t going to hear it living the life I led at a new zip code. My values are being adjusted. My priorities are being straightened out. My endurance is being tested. I am truly learning to wait upon the Lord. We aren’t even going to get a house right away at this point. He will tell us when it is right. There is a lot to go through still. There is a lot to learn about living in Presence rather than myself. But as Derek and I reflected on the number 41, he felt it was a return on those “40” whatevers we have just come through. A restoring of what was sacrificed. A healing of the days of tears. Yahweh gave it all back …plus 1. Derek / Ginger – Such joy to hear from you and learn your news! That the home is rented and you are transitioning in to life in New Mexico. I bless you, be encouraged that yes, every little thing counts in His Kingdom, and expands for good. We praise God his perfect love displaces all darkness, and that, as we release Him, where ever we go, atmospheres change as his Kingdom comes. Do not despise the days of small beginnings. Keep filling up and leaking Jesus! I bless your hearts’ commitment to serve Him. You’re doing good! (See, even your little blogged email has borne fruit.) We love you. Remember to rest in Him – even as you keep pressing on together toward the mark of the prize of the high calling in Christ Jesus. Until next time … Blessings. Peace. Joy. Grace.